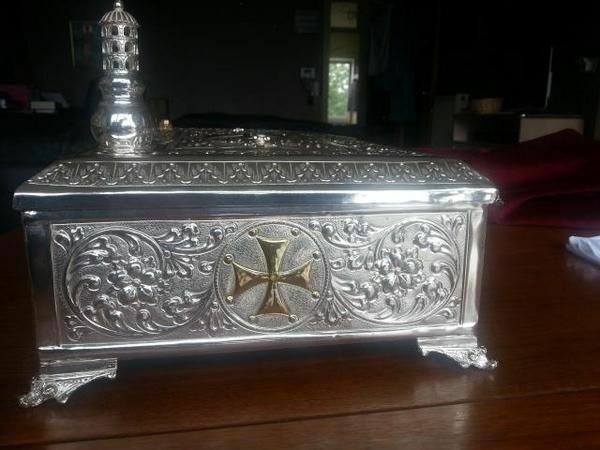 A 45 centimeter long, 25 wide and 7.5 deep silver reliquary, owned by the Greek orthodox church in Rotterdam, was stolen on Saturday afternoon. According to “Algemeen Dagblad” reports, the box contained pieces of the holy cross where Jesus Christ was crucified 2000 years ago, along with other valuable items. The reliquary was in a bag on the back seat of Father Christos Sidiropoulos’ car, which was parked at the church on Westzeedijk street in Rotterdam. The thieves broke the window and stole the bag items. Most of the stolen items were found in the area around the church, but the silver reliquary is still missing. The worth of the reliquary is invaluable. “You cannot put a price on it,” said Father Sidiropoulos. The Greek priest told “Algemeen Dagblad” that apart from the pieces of the wooden crucifix, there is also an image of a holy man who was called upon to heal his eye in his youth. Local police made a public announcement about the reliquary’s theft on September 9. A police spokesman suggested that the reliquary may have been put up for sale.